Sweeny, Alastair. "Sir George-Étienne Cartier". The Canadian Encyclopedia, 01 March 2019, Historica Canada. https://www.thecanadianencyclopedia.ca/en/article/sir-george-etienne-cartier. Accessed 18 April 2019. Sir George-Étienne Cartier, co-premier of the Province of Canada, lawyer, rebel, railway promoter, politician (born 6 September 1814 in Saint-Antoine, Lower Canada; died 20 May 1873 in London, England). The Honourable Sir George-Étienne Cartier, Minister of Militia and Defence, June 1871. 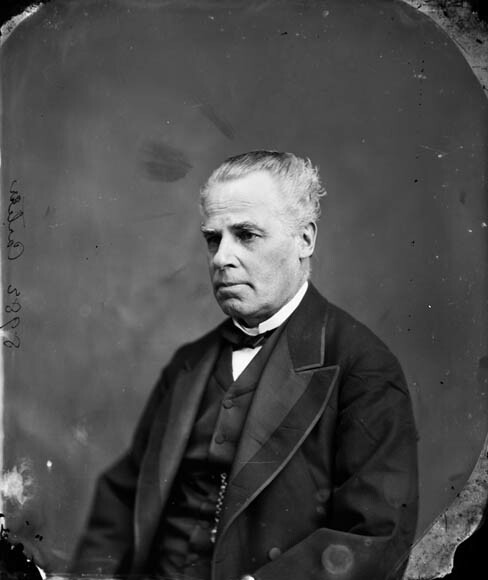 Sir George-Étienne Cartier, co-premier of the Province of Canada, lawyer, rebel, railway promoter, politician, Father of Confederation (born 6 September 1814 in Saint-Antoine, Lower Canada; died 20 May 1873 in London, England). A former rebel against the government (see Rebellions of 1837), Cartier also served as Canada's first minister of militia and defence. Arguably the kingpin of Confederation, Cartier was responsible for bringing French Canada, Manitoba and British Columbia into the Dominion. From a wealthy family of grain exporters and millers, and, according to family legend, a descendant of the family of Jacques Cartier, he dominated the politics of Québec for a generation. A graduate of the Sulpician Collège de Montréal and called to the bar in 1835, Cartier joined the radical Fils de la Liberté (Sons of Liberty), to fight against the Château Clique. 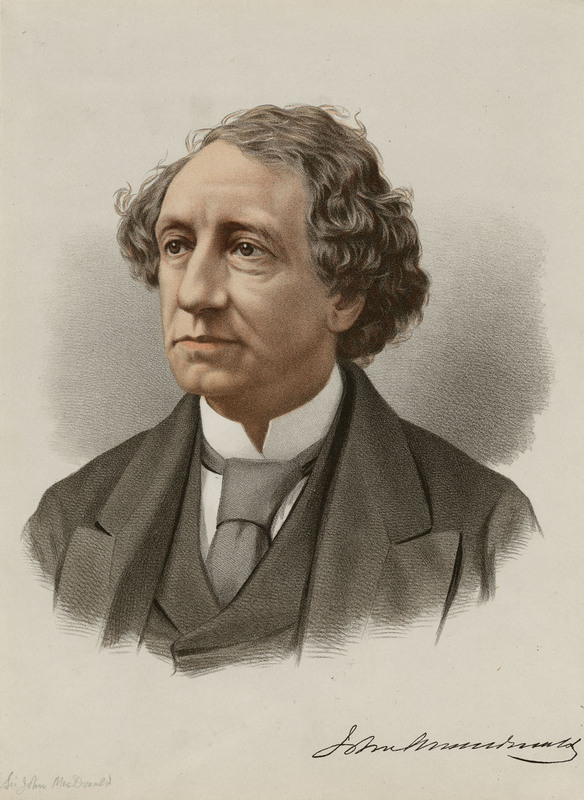 He composed the patriotic song "O Canada, mon pays, mes amours" — perhaps the model for the later national anthem — and was secretary of the reorganized Saint-Jean-Baptiste Society in 1843. In 1837 at Saint-Denis, Cartier fought bravely alongside Wolfred Nelson and the rebels as they successfully routed Colonel Charles Gore's force of British regulars (see Rebellions of 1837). After a narrow escape and exile in Vermont, he successfully petitioned in 1838 to return and practise law in Montréal. Among his clients were the Sulpician Order, the original seigneurs of Montréal, and the St. Lawrence and Atlantic Railway. Cartier soon became active in politics and in 1841, became Louis-Hippolyte LaFontaine's campaign manager and right-hand man. The two were dedicated to reforming the Civil Code and restoring the Assembly of the Province of Lower Canada, where French Canadians held a majority and which had been nullified by the Act of Union (1840). With responsible government won in 1848, he ran and was elected as a Liberal Reformer in Verchères, and was soon brought into Cabinet. 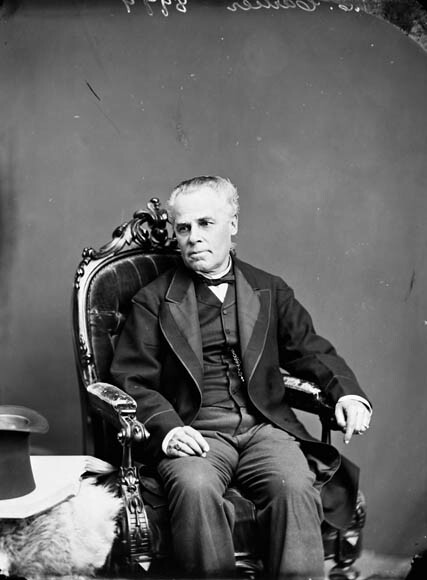 Cartier moved to Montréal East in 1861 after the coalition with the Canada West (Upper Canadian) Conservatives, and as Bleu chief served as co-premier with John A. Macdonald in the Union parliaments of 1857–58 and 1858–62, in which ministry he set in motion the movement toward Confederation. 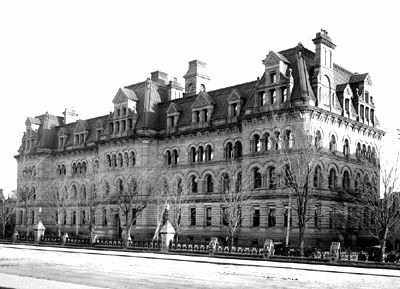 One of his chief achievements in the period was his engineering of the Queen’s choice in 1857 of Ottawa as the capital of the Canadas. His reasoning was this: Ottawa was more defensible militarily than Toronto, Kingston, Montréal or Québec. It was on the border between the two provinces of the Union, was also on the route of the planned railway to the northwest and the Pacific that would make Montréal the entrepôt of a continental trading system. In the years leading up to Confederation, Cartier and his large block of supporters from Canada East (Lower Canada) allied with Macdonald’s smaller cohort of Conservatives from Canada West (Upper Canada) to create political deadlock in the Province of Canada. They finally convinced George Brown and his supporters to join the Great Coalition, and work toward a wider union of the provinces of British North America. In the conferences that followed, Cartier’s goal was to ensure that Canada was to be a federation of provinces rather than a single legislative union like Britain. At the Charlottetown Conference in 1864, Cartier led the Canadian case for a great confederation of all the colonial provinces, inspiring the Maritime delegates with a commitment to build the Intercolonial Railway. At the Québec Conference, Cartier argued for the creation of a new “political nationality,” and denounced Rouge leader A.A. Dorion’s contention that French Canada would be better off joining the United States, by stating that French interests could be preserved under the proposed Confederation. At Confederation, Cartier chose the militia portfolio, with the aim of building up a national force strong enough to resist any invasion or interference from the United States; a strong military was also key to securing the entry of the north-west into Confederation. In these first years of Confederation, Cartier often served as acting Prime Minister during Macdonald's illnesses and played a key role in securing Rupert’s Land (1869) and in drafting the Manitoba Act (1870) and British Columbia Act (1871). In 1868–69, he and William McDougall negotiated in London for the transfer of the HBC territory of Rupert's Land and the North-Western Territory to the Dominion. Due to his close relations with British railway builders, military officials and financiers, Cartier was fully in tune with imperial interests regarding an eventual “All-Red Route” to the Pacific and Asia through Canada’s huge new territory. McDougall was appointed lieutenant-governor of the area, but was prevented from entering by Louis Riel and his men (see Red River Resistance). Cartier may have met Louis Riel (both had been educated at the Collège de Montréal, although not at the same time). Cartier sympathized with the Métis, and played a key role in negotiating their acceptance of provincehood through their emissary, Abbé Ritchot. After passage of the Manitoba Act on 12 May 1870, Cartier sent Adams Archibald and many of his own hand-picked men to administer the new province. Cartier welcomed British Columbia delegates John Sebastian Helmcken, Joseph Trutch and Robert Carrall to Ottawa in June 1870, and promised them a transcontinental railway if British Columbia joined Confederation (the delegates had planned only to ask for a wagon road east). He negotiated the Terms of Union with British Columbia, which were passed in 1871. Cartier promoted the development of rail throughout his career. He was heavily involved in the development of the Grand Trunk Railway, becoming its solicitor, and chairman of the Railway Committee of Parliament in the Union government. Cartier was also a driving force in the early promotion of the Canadian Pacific Railway, to seal the bargain with British Columbia, and make Montréal the terminus of a transcontinental trading network. However, Cartier’s plans were opposed by rival railway promoters in Boston and Philadelphia, who wanted to tap into the trade of the Canadian north-west by railway lines crossing the border. These promoters heavily financed Cartier’s political rival in Montréal East, Louis-Amable Jetté of the short-lived Parti national, leading to Cartier’s defeat in 1872. Louis Riel quickly offered to resign his own seat in Manitoba, and Cartier soon became the MP for Saint Boniface. The American promoters then engineered the release in April 1873 of election fundraising telegrams — the so-called Pacific Scandal — while heavily subsidizing their own Canadian supporters. Cartier, whose letters had promised to consider awarding Sir Hugh Allan the railway contract, was already mortally ill with Bright's disease when the scandal erupted in the Commons. He died soon after seeking treatment in London and the CPR languished for almost a decade. As the chief voice of the French Canadian community, the pivotal point of the union, Cartier was the kingpin of the Confederation movement. He masterfully made use of his block votes, and his railway and militia interests, to engineer a new union and a new nationality. He reconciled the majority of French Canada to Confederation on the grounds that it prevented annexation by the United States and made possible the end of the Union government and the restoration of the old Province of Québec. Cartier played the primary role in bringing Manitoba and British Columbia into Confederation, and negotiated the purchase of Rupert’s Land and the North-Western Territory from the Hudson’s Bay Company. J. Boyd, Sir George Étienne Cartier (1914); Alastair Sweeny, George-Étienne Cartier (1976) (online revision at http://www.canadachannel.ca/cartier/); B. Young, George-Etienne Cartier (1981). Cartier, George-Etienne, Sir, 1814-1873Brief biography of Sir George-Étienne Cartier with digitized copies of related correspondence. From Manitobia.ca. George-Etienne CartierA review of two biographies of Sir George-Étienne Cartier that examines his controversial political legacy. From the Manitoba Historical Society website. Sir George-Étienne Cartier National Historic Site of CanadaBrief profile of Sir George-Étienne Cartier from Parks Canada. The Hon. Sir George-Étienne Cartier, P.C., Q.C.Parliamentarian File for The Hon. 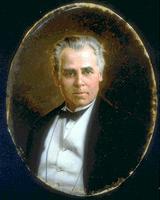 Sir George-Étienne Cartier, P.C., Q.C. From the Library of Parliament website. Sir George-Étienne CartierA profile of Sir George-Étienne Cartier that focuses on his enthusiastic support for the fledgling railway industry in Canada. From the Canadian Railway Hall of Fame.